If you have severe arthritis in your knee or knees, you may benefit from physical therapy to help improve your knee range of motion (ROM) and strength. Sometimes the pain, limited motion, and joint degeneration are too severe, and surgery is necessary to restore optimal function of your knee. A total knee replacement (TKR) surgery is typically done when severe arthritis causes knee pain, limited motion, and extreme difficulty with walking. If you have had a TKR or are expecting to have one, you may benefit from physical therapy after surgery to help you regain your normal mobility. A knee post-operative protocol is a general guideline that your surgeon and physical therapist may follow to ensure that you are progressing properly after your surgery. The TKR protocol provides you and your physical therapist a framework on which to build your rehabilitation program. If you are expecting to have a TKR surgery, ask your surgeon if he or she has a specific post-operative protocol that you should follow. If not, your physical therapist may have one that can help you understand what to expect during your rehabilitation after your TKR surgery. When you wake up after your TKR surgery, your knee may be in a device called a continuous passive motion (CPM) machine. This machine helps to gently and slowly bend and straighten your knee while you are lying in bed. There are settings on this machine to adjust the amount of motion that occurs at your knee joint. Your doctor and physical therapist can work with you to make sure the CPM machine is set properly. On your first day after your TKR surgery, you may be visited by a physical therapist in the hospital. He or she will help you sit up in bed, get out of bed, and start to walk. Usually, a standard walker or a wheeled walker is used after surgery to help provide extra support while you are walking. Your acute care physical therapist will also instruct you to perform knee exercises while you are in the hospital. These exercises are designed to help improve your knee ROM and strength and can help keep your ankles and hips moving to make walking easier. Simple exercises like pumping your ankles and squeezing your buttocks can prevent blood from pooling in your body. This is important to help prevent a serious condition called a deep vein thrombosis (DVT). Your main goal in the hospital after TKR is to become independent in with functional mobility so you can leave the hospital and go home. This includes being able to move in bed, get out of bed, and walk. If you have stairs in your home, it is important to be able to navigate those stairs, and your PT in the hospital can help you master this task. After 2 to 3 days in the hospital, you should have improved functional mobility and may be discharged to your home. Of course, if you still require skilled nursing care or more intense rehabilitation, you may be moved to a sub-acute rehabilitation facility. There you will be able to focus more on gaining knee range of motion and strength to ultimately improve your function enough to go home. Sub-acute rehabilitation lasts about 1 to 2 weeks, and a typical day involves two sessions of physical therapy. Your PT will continue to work on improving your knee strength and ROM, and you may continue with the CPM machine if your doctor feels it is necessary. If you are sent home from the hospital, you may choose to have a home care physical therapist come to your house for your rehabilitation. This is usually reserved for people who may have a difficult time traveling to an outpatient physical therapy facility. The focus of home physical therapy is to maximize your safe functional mobility in your home. You will likely continue on working on knee ROM and strength. Functional mobility like walking and stair climbing may also be a part of your home physical therapy after TKR. As your surgical incision heals, your physical therapist may begin gentle scar tissue massage and mobilization to help improve the mobility of your incision. This can help the skin and other tissues around your knee move better and more freely. If you are able to travel to a physical therapy facility, you may begin outpatient physical therapy. Here, your physical therapist will continue to work on improving your knee ROM, and it is expected that you are able to bend your knee to a 90˚ angle be the end of week 2. By the third week after your TKR surgery, you should be working in an outpatient physical therapy facility. More aggressive ROM exercises can be started, and your knee motion should improve gradually to about 100-105˚ by the end of week 6. Many people benefit from riding a stationary bicycle after TKR surgery. Your physical therapist will help determine the proper seat height for you. Don't be surprised if you are unable to pedal all the way around when you first start on the bike. Gradually work the pedals forward and backward, and as your ROM improves you should be able to fully pedal the bike. There should be a continued focus on strengthening exercises after your TKR surgery, and your PT will teach you exercises to improve the strength of your quadriceps, hamstrings, and hip muscles. Progression of simple straight leg raising exercises can be done by adding cuff weights to your lower leg or ankle. Your physical therapist may also wish to use neuromuscular electrical stimulation (NMES) to help improve the muscular activation of your quadriceps. This therapeutic modality helps to contract your quadriceps muscle for you and improve your ability to contract this muscle on your own. During the 3 to 6 week post-op period, your physical therapist will help you improve your walking ability. He or she can help you progress from using a walker to using Lofstrand crutches, and finally, to use a cane. At the end of week 6, you may even be able to walk with no assistive device. During this time, your physical therapist may have you continue to use ice to help control pain and swelling that is around your knee joint. Sometimes swelling persists for many weeks after TKR surgery. During the final two weeks of your post-operative TKR rehabilitation, you should be working with your physical therapist to maximize your functional mobility. Exercises should continue to focus on gaining strength in the muscles around your knee and leg. More advanced balance exercises can be progressed, and the use of a BAPS board may be included in your therapy to maximize your balance and proprioception. During this time, you should be able to fully progress to walking normally with no assistive device, and your pain should be under control. As you approach the end of your TKR rehabilitation, you should discuss with your PT options for continuing your exercise program independently. Having access to a fitness facility with stationary bicycles and weight training equipment is a good option to help you maintain your mobility and strength after TKR surgery. Remember that every person is different, and many factors help determine the overall outcome after TKR surgery. While a week-by-week protocol provides a general framework of what to expect after surgery, your specific progression through the protocol may be faster or slower. 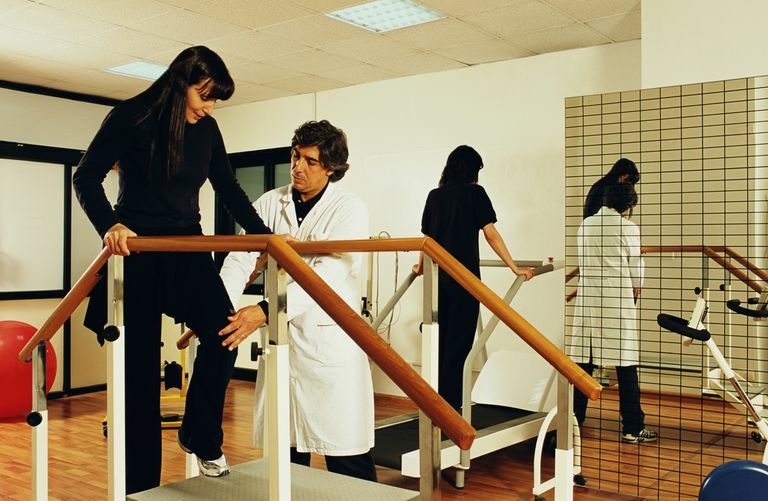 Be sure to work closely with your doctor and physical therapist to ensure that your TKR rehabilitation is successful. Stevens-Lapslet, JE, Balter, JE, et al. "Early Neuromuscular Electrical Stimulation to Improve Quadriceps Muscle Strength After Total Knee Arthroplasty: A Randomized Controlled Trial" PHYS THER. 2012; 92:210-226.